The weight of heavy snow caused some trees to split in half. 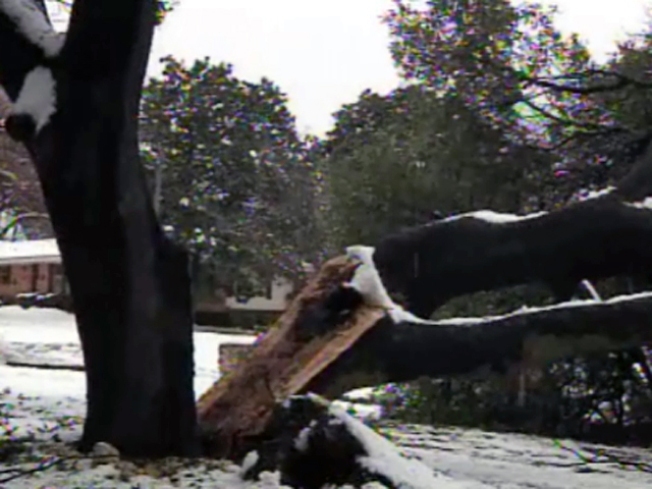 North Texas' heavy snowfall piled up on trees, snapping their limbs after a few hours. Several trees had split in half at the trunk. Becky Sherman, the owner of one split tree, said the cleanup is annoying -- and will be costly. "It's really disappointing in that way, because we think it takes away a lot of value from the house," she said. Sherman’s daughter was inside the home when the 50-year-old tree split in half. 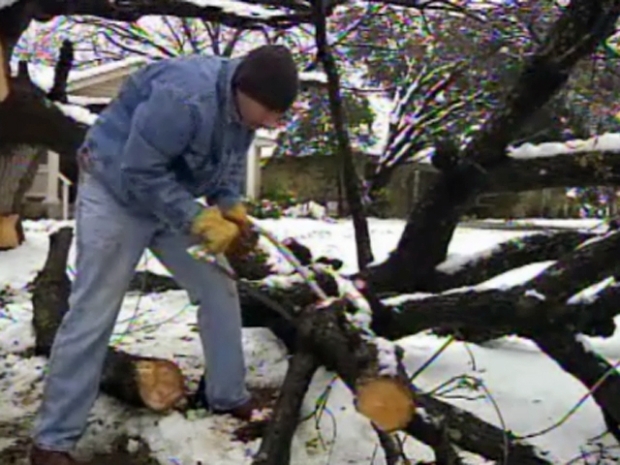 The heavy snow piled up on trees, breaking limbs and splitting trees. "She heard the big boom and came outside, and it had fallen down right by her snowman over there," Sherman said. Sherman, a Fort Worth native, liked the snow at first. But as large branches began falling all over the neighborhood, her excitement faded. She said she warned her children the trees could split after she heard them start to creak from the weight of the snow. But one man’s trash became another man's treasure. Guillermo Mateo and his son were in the neighborhood Friday, removing debris from people's yards. "A friend of mine called me and said, 'Well just come on over to my house. I’ve got a big old tree right here, come and cut it,'" Mateo said. The friend lives down the street from the Shermans, so he stopped by to offer his services. "Yeah, we just looking for some trees like this one right here, and if they need help, we cut it," Mateo said. The weight of the remaining snow is still a safety concern. Parents should warn their children to not stand under them until the danger of falling branches goes away. A record 12.5 inches of snow fell in a 24-hour period at Dallas/Fort Worth International Airport, with a record 11.2 inches falling Thursday. The previous 24-hour record was 12.1 inches. The previous daily record was 7.8 inches on Jan. 15, 1964, and Jan. 14, 1917.